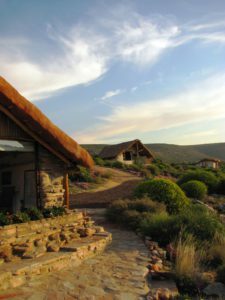 The cottages and boma were designed to blend into the landscape using straw bales construction for walls and roofing material. They provide great insulation and low visual impact. The building materials were all sourced locally; eucalyptus timber poles cut at a nearby site in an alien clearing program; local rock for paving and natural materials on the property were used to enhance the cottages. The doors, window frames and fittings were rehabilitated from demolished buildings, providing an interesting history themselves. The building sites used were badly eroded; all levelled by hand and no heavy machinery was brought onto site. The buildings are north facing maximizing the use of the sun in winter to keep the buildings warm. Solar power is used to light the buildings at night, for the fridges and to pump water from the river. We are totally independent of the municipal electricity and water grids; this reduces our demand on these resources and minimizes our carbon footprint. The bathroom outlets are treated with micro-organisms in septic tank systems which feed into a French drain. We recycle all, glass, tin and plastic and the organic waste from the kitchen is composted which provides food for our organic garden where we grow in season salad and vegetables. The area was once badly over-grazed by goats their lasting effect is being dealt with on an on-going basis. To combat the erosion we are removing and using the pioneer plants to stabilize the soil. These areas are then self-seeded with indigenous plants. The pioneer plants protect the seedlings from the harsh environment and trap water for them. Oudrif is busy with on-going efforts to rid the river banks of invasive alien trees, oleander, Port Jackson and Honey Mesquite, It is a long term project with lasting effects.